"So right off the bat, your first ever press conference, you get in there and it's the day after the inauguration, right? And you are charged with the job of going in front of the press and saying the inauguration crowd was the biggest crowd ever," Kimmel said to Spicer. "If it was up to you would this have even been a topic?" "You know, if it was up to me I probably would have worn a different suit," Spicer said, speaking to the jacket he was wearing during the press conference that many said was oversized. In a wide ranging interview, Spicer and Kimmel touched on Spicer's former role as White House press secretary -- a post he left in July -- as well as Spicer's feelings toward facts. Following a clip of Spicer telling the press that he'd never knowingly say something that wasn't factual as press secretary, but "sometimes we can disagree with the facts," Kimmel asked, "Can we though disagree with the facts?" "You can look at a set of facts and come out with one opinion, but someone else can say the facts are the same here and I come out with a different conclusion," Spicer said. Kimmel responded to this line of thinking with a question, "So, if I were to say to you, I'm sitting on a horse right now?" "Well, you're not," Spicer responded. "Right! Exactly!" Kimmel shouted at Spicer. Spicer added that the White House press corps questioning his integrity on day one was "not something I anticipated." "I'm sure, but when you brought that crowd size thing out, you like opened this terrible Pandora's Box," Kimmel said. "Do you think that is what got you off to kind of a bad start with the press corps?" Spicer responded with a smile, "I don't think it was probably the best start." 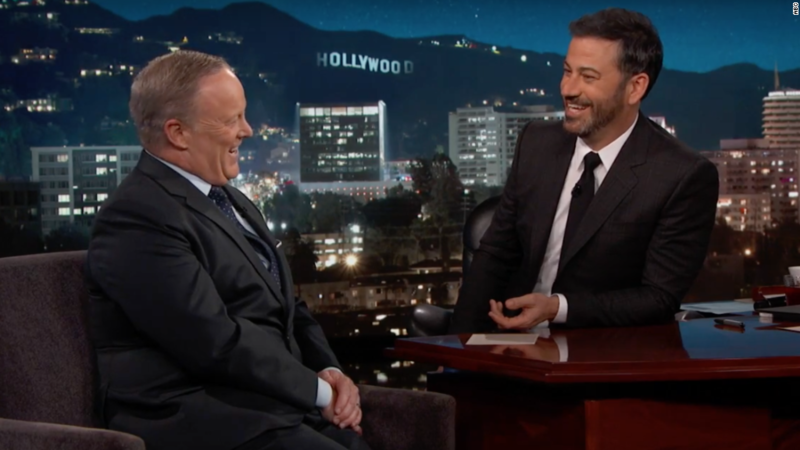 Even though Wednesday was Spicer's personal late night debut, the former press secretary has been a fixture of late night TV as comic fodder for hosts like Kimmel as well as Melissa McCarthy's impression of him on "Saturday Night Live." "That was kind of funny," Spicer said following a clip of McCarthy's impression. The former press secretary said that the president didn't watch all of his press conferences, but would at times provide feedback. "It's my job to speak on his behalf," Spicer said. "So if you're not speaking in the way that he wants, obviously he wanted to make sure he corrected that."